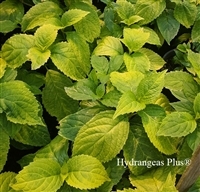 A selection of plants we offer in our "Plus" section. These are unique lacecaps that come from all over the world and offer your garden color, evergreen, texture and outstanding flowers. Zone hardiness to USDA zone 7 to 9 except for Japonica Coerulea which we have found hardy to Zone 5b.